In December, the government moved to “create a stronger and more effective regulatory framework” and improve safety standards by pledging to implement the recommendations in the Hackitt Review of building regulations in full. This, along with August 2018’s Social Housing Green Paper, which suggested that the Decent Homes Standard should be reviewed, has led to a renewed focus on social landlords’ existing housing stock. 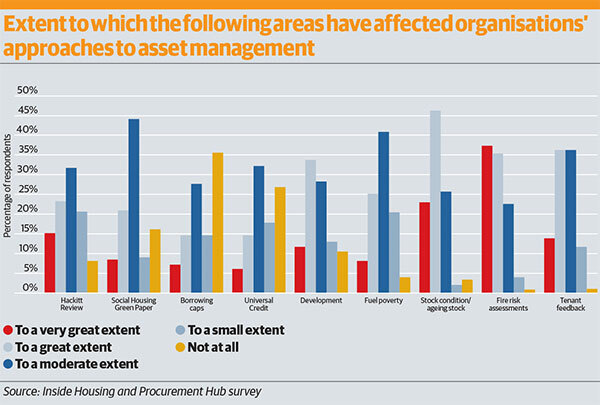 It is against this background that Inside Housing’s recent survey of asset managers, carried out in association with Procurement Hub, received 160 responses from housing associations, ALMOs and stock-holding local authorities. The findings provide a snapshot of how the sector is responding to the renewed focus on building safety standards and organisations’ key concerns and priorities. Perhaps unsurprisingly, nearly 51% of respondents listed compliance as their number-one concern. Quality of data informing recommendations was listed as the top concern of nearly 23% of respondents, however the nearly 30% gap between the two concerns demonstrates how important compliance has become to the sector post-Grenfell. When asked what affected their approach to asset management, 15% listed the Hackitt Review itself as having affected it to a very great extent. A further 24% said it had affected their approach to a great extent. So that’s nearly 40% of the sector for which the review has already had an impact. Assessing fire risk is also, unsurprisingly, a top priority for social landlords. Almost 40% of respondents (37%) stated that fire risk assessments (FRAs) had affected their approach to their job to a very great extent, and a further 35% said that FRAs had affected their approach to a great extent. Then, of course, there is the matter of stock condition and ageing stock, which nearly 70% said has an impact on their approach to asset management. For the next 12 months, compliance is a high priority for 88% of respondents to the survey. Others, in descending order, are tenant satisfaction, development and stock condition data. A total of 59% of respondents said they consider planned and routine maintenance as medium priority, while standards (eg energy saving standards) are considered to be of medium priority by 61% of respondents. Sustainability, while only of high priority for 20% of respondents, is of medium priority for 56%. 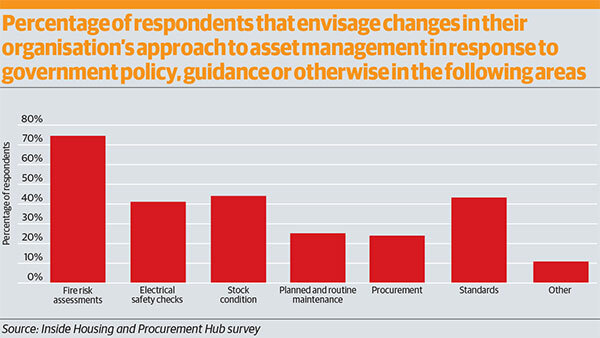 When asked whether they foresaw a change of approach in specific areas of asset management in response to government policy, guidance or otherwise, the largest proportion by far of respondents (75%) cited fire risk assessments as being the area where there was most likely to be a change. This was followed by stock condition (45%) and standards (43%). When it comes to outsourcing of asset management, 71% of respondents said they had outsourced the removal of asbestos, 68% said they had outsourced water hygiene, while 57% and 55% had outsourced gas safety and fire risk assessments respectively. The government recommended the introduction of new, tougher electrical safety standards to protect private tenants in February 2018. These included five-yearly mandatory electrical installation safety checks, as well as compulsory safety certificates confirming that installation checks have been completed. The Social Housing Green Paper asked for views on whether these new safety measures should extend to social housing, as well as views on what constitutes a ‘decent’ home. Against this background, it is interesting to note that 41% of respondents to the survey have outsourced electrical installation condition reports, while 29% would consider doing so. One respondent to the survey noted that their organisation was using a mixture of in-house and external expertise, reflecting a wider trend in the sector for outsourcing where specific expertise is needed. A total of 89% of respondents to our survey said they are definitely aware of their regulatory obligations, and are dealing with them adequately, while less than half that number are definitely confident that their current procurement processes are achieving the best results. When it comes to sustainability, only 25% said they are definitely working to reduce their carbon footprint and reduce fuel poverty, while 73% believe they are doing so to some extent. A total of 67% of respondents were largely confident that they were optimising the income generated by their assets. And what about their spending plans when it comes to asset management over the coming year? The largest proportion (77%) said they would be increasing their spend on measures to improve fire safety compared with last year; 61% will be investing more this year in developing and improving digital access and self-service to tenants for repairs services; and 56% will be investing more in improving and maintaining stock condition data compared with last year. 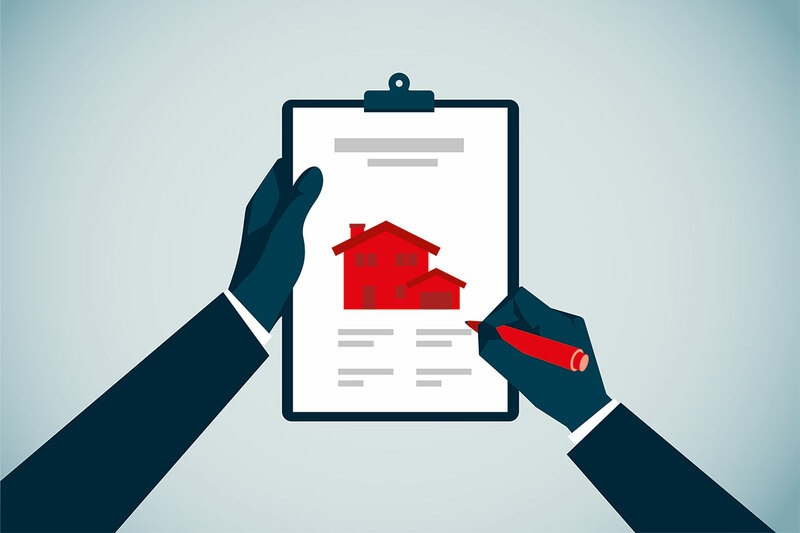 The housing sector appears to be gearing up for further regulatory and legislative changes, and possibly pre-empting them. Webinar: How do fire safety classifications operate in the affordable housing sector?